With difficult times ahead for all, a few tips are available to help you along your way. 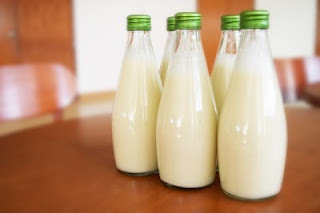 You can freeze milk in its original plastic container or paper carton. However, because milk expands when it freezes, you will need to remove an inch or more milk from a full container to allow for this expansion. You can also freeze milk in freezer-proof glass jars. If you are using narrow-mouth jars, leave 1 1/2-inches of head space. You can store the milk in your freezer for up to three months. It’s a good idea to mark the freeze date on the container with a permanent marker, since the original expiration date will be invalid. When you are ready to drink it, allow the milk to thaw in the refrigerator. Depending on the size of the container, it can take 24 hours to defrost. If some of the milk is still frozen when you want to drink it, you can speed up the process by placing the jug in a bowl or a sink full of cold water. Defrosted milk is safe to drink, but you should be aware that it will look and taste differently than before. First, milk will separate it the freezing process and develop a grainy texture. Shake it thoroughly after it thaws. You also can also beat the defrosted milk with a hand mixer or an immersion blender to restore it to more of its pre-frozen texture. Consume your thawed milk within three to four days after defrosting. Freezing milk in small portions, such as ice cube trays, makes the defrosting process easy and quick. Simply pour milk into clean ice cube trays and freeze them. After they freeze solid, place the cubes in freezer-safe resalable plastic bags or lidded containers. The cubes will keep for up to three months. Thaw what you need in the refrigerator and pop the rest of the cubes back in the freezer for later use. If the defrosted milk’s appearance and/or taste are unappealing – and they are to some people – then you may prefer to use the thawed milk in recipes rather than drink it. Ice cube-sized portions of frozen milk are well-suited for many recipes. Two cubes equal about 1/4 cup milk. You also could try freezing milk in a muffin pan or a mini-muffin pan.